The debate over baptism continues in the modern church. Many say that baptism must be administered only to those who have made a profession of faith, while others will also baptize the infant children of believers. Whatever one’s position, the meaning and significance of infant baptism according to Scripture are often misunderstood. In this helpful booklet, the Rev. 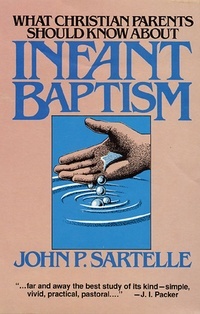 John P. Sartelle explains why it is biblical to baptize the children of believers, considers objections to the practice, and raises important questions for those who do not baptize the children of believers. This booklet provides a helpful analysis of baptism in the context of the larger issues of biblical interpretation and covenant that relate to the sacrament.